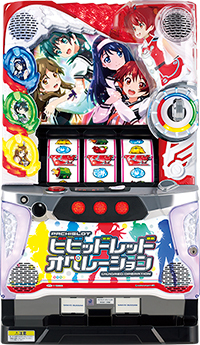 Today, we will be introducing a pachislot machine of “Vividred Operation”. Starting with an “Ignition Key” accessory located on the right hand side of the chassis, this machine faithfully reproduces the theme of “friendship is the key to protect the world”, just like in its original TV animation. “Docking Operation” in which Akane, the protagonist of this animation, docks with her friends is a must watch! It has already made its debut to parlors. Let’s enjoy the actions of cute and beautiful girls!